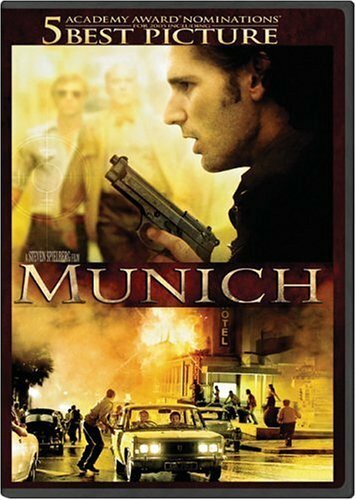 Munich (2005) is a fictionalized account of real events following the brutal murder of the Israeli Olympic team at the 1972 Munich Olympics. Prime Minister Golda Meir authorized the assasination of 11 surviving men who had been involved in the murders, members of the Black September militant group. Secret squads of agents were assembled for the task. The film, which producer/director Steven Spielberg describes as “historical fiction” simplifies the account considerably, telling the story of the assasinations mostly from the point of view of the leader of one of the squads, Avner, played by Eric Bana. The film received good reviews and was nominated for five Academy Awards: Best Picture, Best Director (Spielberg), Best Adapted Screenplay (Tony Kushner & Eric Roth), Best Film Editing (Michael Kahn) and Best Original Score (Composed by John Williams). The screenplay is based on the book, Vengeance: The True Story of an Israeli Counter-Terrorist Team by journalist George Jonas, which in turn was based on the story of Yuval Aviv, who claims to have been a Mossad agent. The film begins as a conventional thriller but moves steadily into an examination of questions about justice, revenge, and the human costs of each. Each of the men on the squad is changed by his experiences carrying out the orders. Several of them eventually question the morality of the orders. The film also includes several discussions Avner has concerning the nature of home and family: with his fellows, with a young Palestinian leader about his own age, and with the father of the mysterious French informant who sells them the whereabouts of their quarry. There were two sets of controversy surrounding the film’s content. Some critics, including Zionist organizations and Leon Weiseltier of the New Republic, felt that the film erred in presenting terrorism and anti-terrorism as morally equivalent activities. Other critics wrote that no such equivalency was made, rather that the film raises the issue of the toll that this sort of activity exacts on the individuals who carry it out and on the nation that sponsors it. Other critics have argued that the film did not depict the events accurately enough, leaving out essential parts of the true story such as the Lillehammer Affair (in which an innocent man was assassinated in a case of mistaken identity.) Israeli sources have suggested that the film’s depiction of the questioning and soul-searching of the agents is mere fiction and seriously misleading. Note: this film is extremely violent and not suitable for children or the sensitive. The film raises some of the complex questions that bedevil the subject of a proper response to terrorism. Tthe rabbis of old were very clear that the lex talonis (“An eye for an eye, a tooth for a tooth”) was not to be taken literally, and that justice is something that happens in a court, not by private revenge. Civilized people seek justice under the law rather than revenge. However, in 1972 the Israeli leaders believed that it was essential to retaliate for the murders of its athletes because the rest of the world seemed uninterested in pursuing justice in this case. The Games continued, and in many parts of Europe, the Black Septemberists were portrayed as heroes, not as murderers. I remember vividly watching the events of Munich unfold on our family TV when I was a teenager. I recall being shocked that the Games simply continued after a mass murder, and that the Germans, indeed the world, seemed to feel that since many of the terrorists were dead, there was nothing for the police to do. I confess that I was glad later when I learned that the Israeli government decided to take action, although this film makes me wonder at the methods and the cost. I believe it is important both to ask this sort of question and to remind myself, and my reader, that this film is a work of fiction. The truth is I do not know how truthfully it depicts the decisions and actions of the real people. It is useful for theoretical speculation, but it is not useful for passing judgment either on Golda Meir or, for that matter, on Yuval Aviv, the man upon whom the fictional character Avner is supposedly based. For that, we need facts, not fiction. At the end of the film, Avner says to Ephraim, his Mossad handler, “What did we accomplish?” pointing out that everyone they killed had been replaced by someone even more brutal. Ephraim, played by Geoffrey Rush, gives a reply indicating that he thinks Avner’s question is naive. The question is left in the viewer’s lap: is this necessary? Is it right? Is it really the best option? One of the more interesting aspects of the film, to me, is the question raised by one of Avner’s team: why didn’t they capture those guys, take them back to Israel, and put them on trial like Eichmann? In Golda Meir’s speech early in the film there is a suggestion that the proper response to terror is more terror: scare them so they won’t do this again. Another reason given early in the film is that it is much easier to kill them than to kidnap them. Has anyone ever come up with a truly effective response to terrorism, one that does not simply breed more terrorists? 1. Has a work of fiction ever shaped your understanding of a historical event? Is it responsible for a filmmaker or novelist to “fictionalize” an account of a historical event? Does the artist have any responsibility to let viewers know which parts of the film or novel are fiction? Does the viewer or reader have any responsibility to search out the facts? 2. What do you think the Israeli government should have done in response to the murder of the Olympic team? Why? 3. What is the difference between justice and revenge? Which term would you use to describe the events in this film? This entry was posted in United States and tagged Anti-Semitism, Drama, Ethics, Jewish Values, State of Israel, Suspense. Bookmark the permalink.